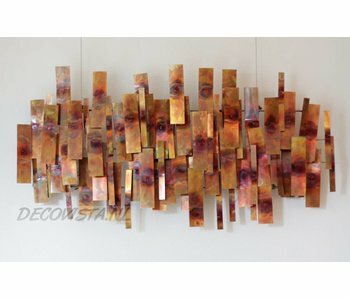 High quality metal wall-art sculptures designed by C. Jeré. This wall decoration is signed and comes with a certificate by Artisan House. 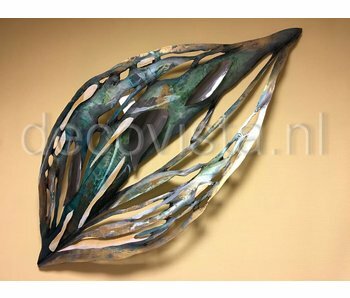 Wall object by C. Jere, wall sculpture Eden. Completely hand made of steel and copper, painted in yellow, green, gold. The iridescent colors give the stylized leaf special touches. Size 143 x 69 x 10 cm. Shipping costs on request. 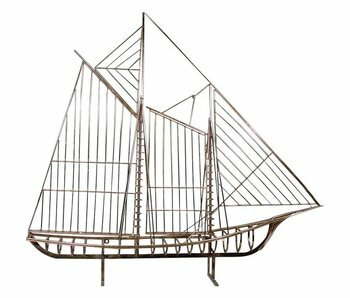 Handmade sailboat skelleton of The Mariner, Can be hung or put down. Signed: C. Jeré. Size: 116 x h 105 x 17 cm. 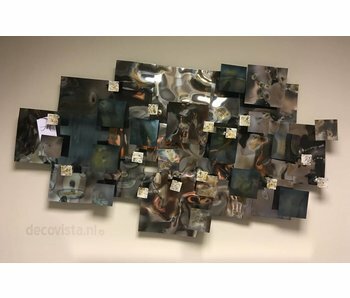 Aquous is an exclusive, handmade 3D metal wall sculpture with an industrial look. Dimensions: 119 x 69 x 15 cm. 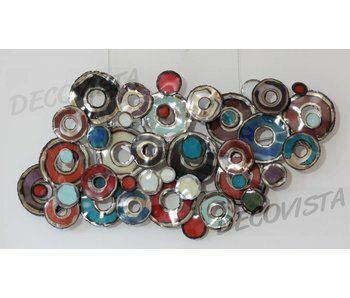 Wall art Sterling Journey presents exquisite shades of silver. 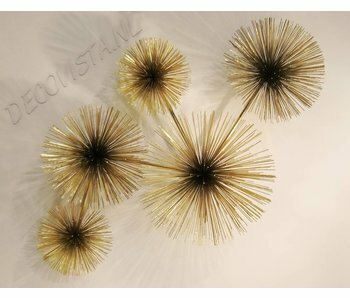 The piece's textured round shape is split vertically into two pieces with a robust metal ball joining both sections together near the items top. Diameter 94 cm. 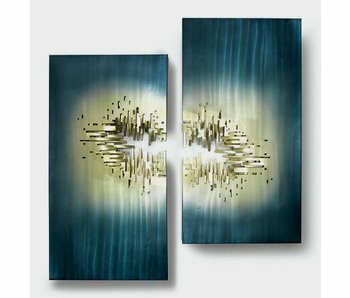 Wall sculpture From The Depths is a set of two steel objects, lacquered in deep steel blue overflowing into green and golden tones. Sizes: each 48 x 91 x 8 cm. Raindrops ist eines der bekanntesten Designs von C. Jeré. 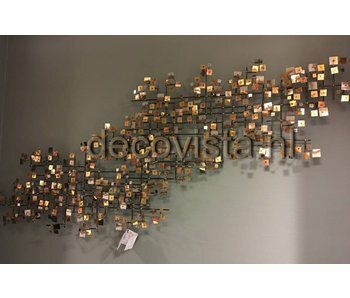 Eine beeindruckende Metall-Wandskulptur mit Halbkugeln und flammenbearbeiteten Scheiben. Ca. 170 cm breit. 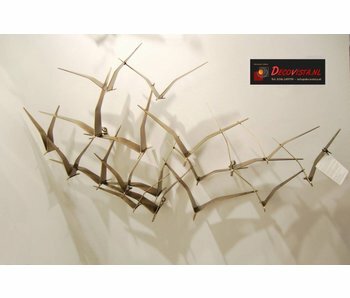 Handmade metal Wall Art Sculpture flock of birds Seagulls II - Brass by C. Jeré. Signed C. Jere, 1994. Includes certificate of authenticity. Size appr. 122 x 59 x 14 cm. Gravity is the only way to explain what keeps this unique sculptures ~spinning~ pair of wheels from flying right off the wall! Each round circle is embellished with flame-treated copper bolts. Decorate your kitchen with this steel, steaming coffee cup. The contours of this 3D sculpture have dark accents. Signed C. Jeré with certificate. Dimensions: W 50 x D 28 x H 58 cm. 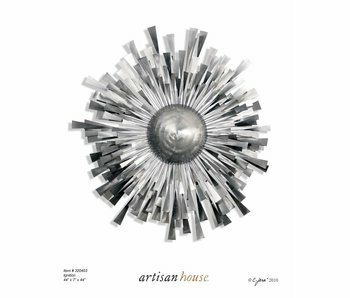 For more than four decades, Artisan House’s vibrant, versatile designs have been recognized as multi-dimensional “metalworks of art.” In 1964, partners Jerry Fels and Kurt Freiler branched out into the specialized world of metal art. Previously, Fels operated Renoir of California — a jewelry house that designed and produced collections of copper jewelry. It is a combination of Fels and Freiler’s names that make up the signature C. Jere that marks every Artisan House handmade sculpture. 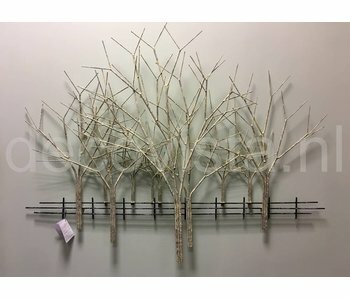 Artisan House wall sculptures elevate the look of any room or outdoor setting thanks to a comprehensive array of designs showcasing multi-colored, cool and warm tones; nature-themed pieces with earthly inspirations; and sculptures reminiscent of activities that relax, excite or inspire. Tabletop and freestanding floor pieces also make dynamic statements in the home or out-of-doors. Before new product designs debut each April and October, hundreds of sketched or proposed designs undergo an initial review. Then, prototypes are made and final pieces are selected by a panel of design authorities. 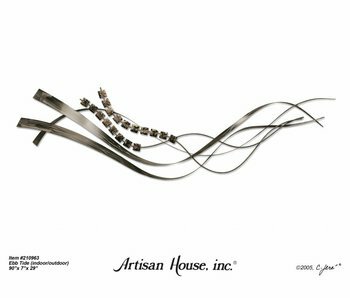 Because many members of Artisan House’s finishing staff have worked with the company for more than 30 years, they are highly skilled at collaborating with studio artists to help make their original designs come to life. 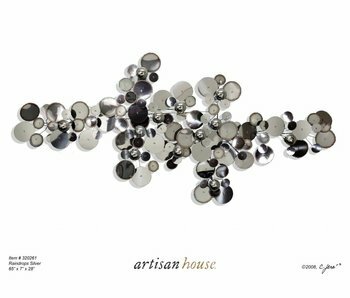 Upon completion, every Artisan House sculpture is copyrighted and signed and dated by the artist. 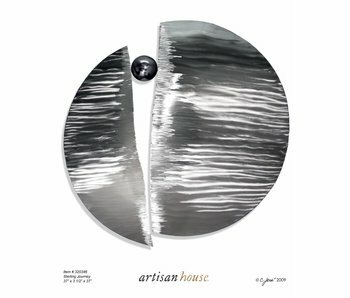 Today, Artisan House offers its discerning clients an ever-evolving roster of more than 350 pieces. 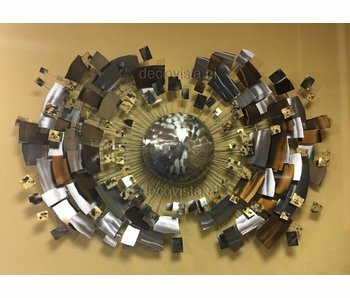 New metalworks designs are introduced twice annually at major markets. All handmade items are created by master artists at the firm’s C. Jere Design Studio in Burbank, California. 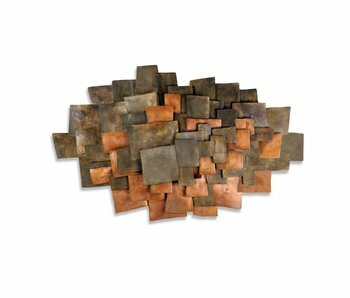 Wall sculptures and items especially crafted for long-lasting display in today’s outdoor living spaces consistently rank among the company’s top sellers. 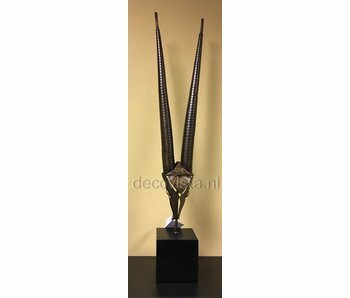 Sculptures are handcrafted of rich metals including copper, bronze, brass, steel, aluminum and chrome. Each piece is hand finished with intriguing surface treatments, paints and patinas. 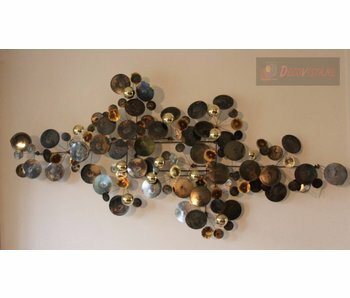 For example, pieces may incorporate ground steel, brushed stainless steel, flame-treated copper or hammered brass — or combine two or more metals like painted brass and steel with flame treated copper. 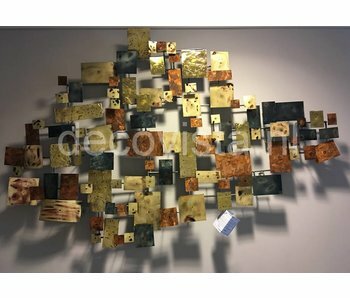 Due to the abstract nature of most Artisan House pieces, many can be hung upside down or at an angle, as well as used in multiples for a larger configuration or to create a bolder statement.